B Nailed To Perfection: Meebox - Splash! Wow wow wow Meebox has knocked it out of the ball park this month guys! Meebox are a monthly nail polish subscription box and they have featured on my blog a few times. Here and here. 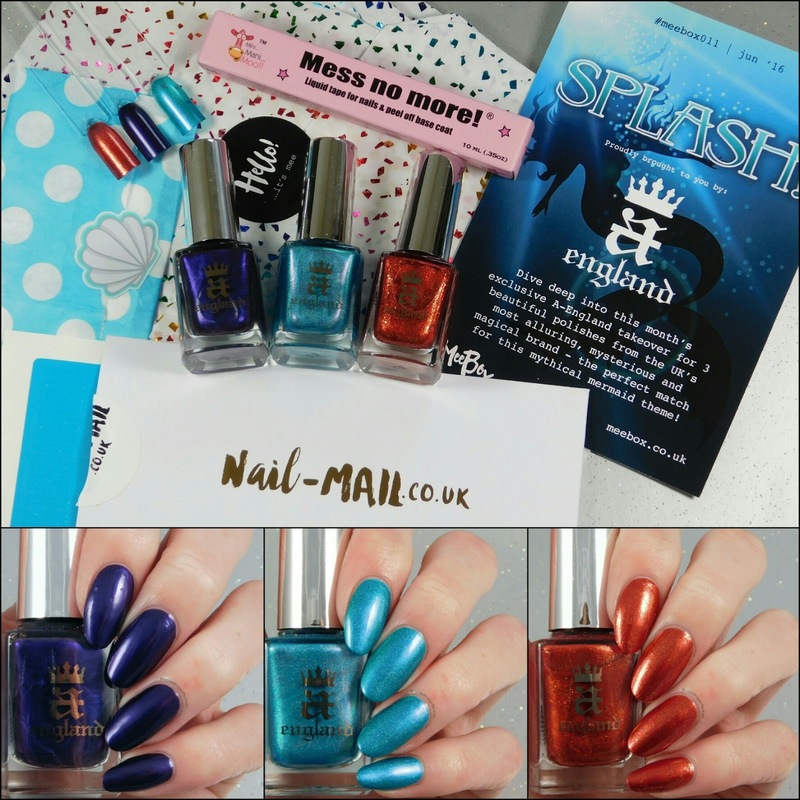 Last month we all found out that the theme for this month was Splash! and it was a full UK Indie takeover. There was a lot of speculation about who the indie would be and all the guesses were unanimous and of course correct- A England. 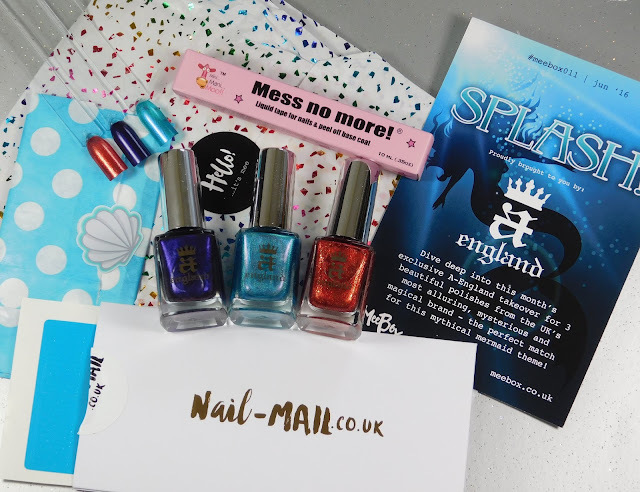 In the box there was: Mess no more liquid latex from Mini Mani Moo, swatch sticks, mermaid stencils from Nail-Mail, and some shell and starfish embellishments from She Sells Seashells. The polishes in this box are just amazing! 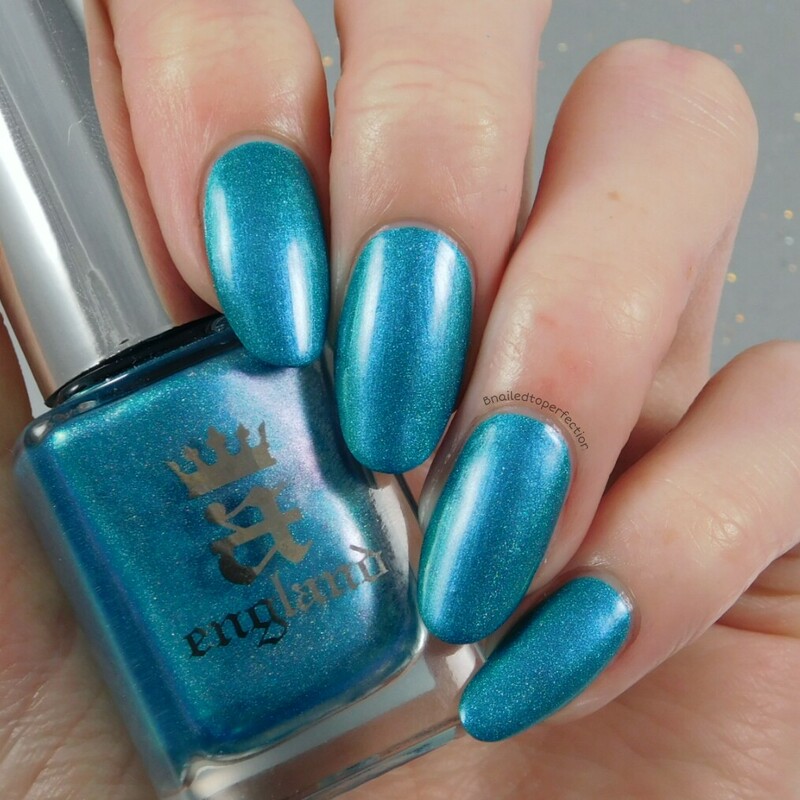 These are my first A England polishes and I'm so pleased, especially that I finally own Whispering Waves. The other two are The Blessed Damozel and Gloriana. 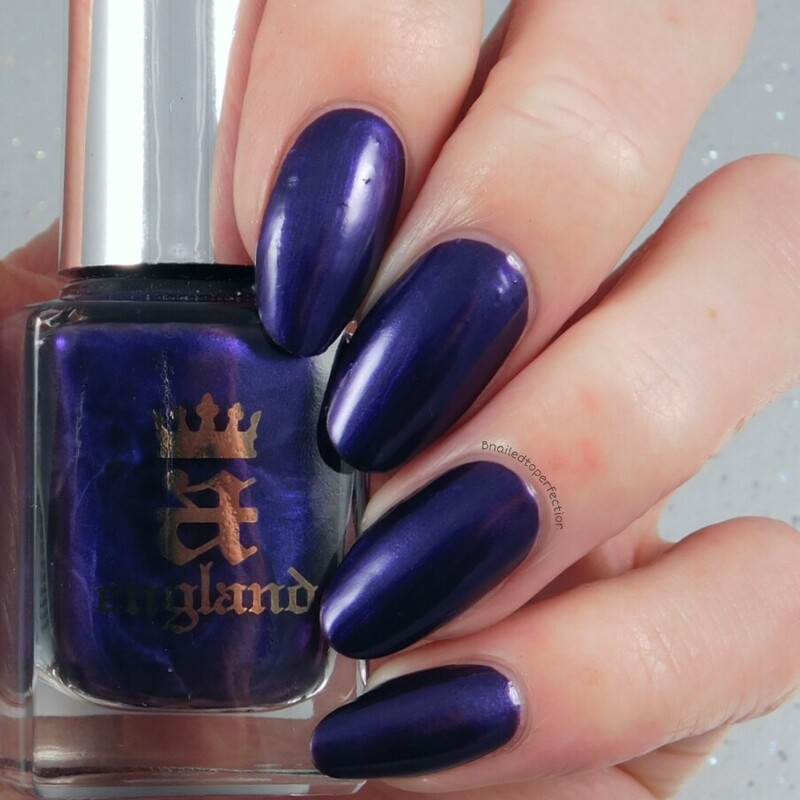 Gloriana is not a colour I would normally go for but it it stunning. 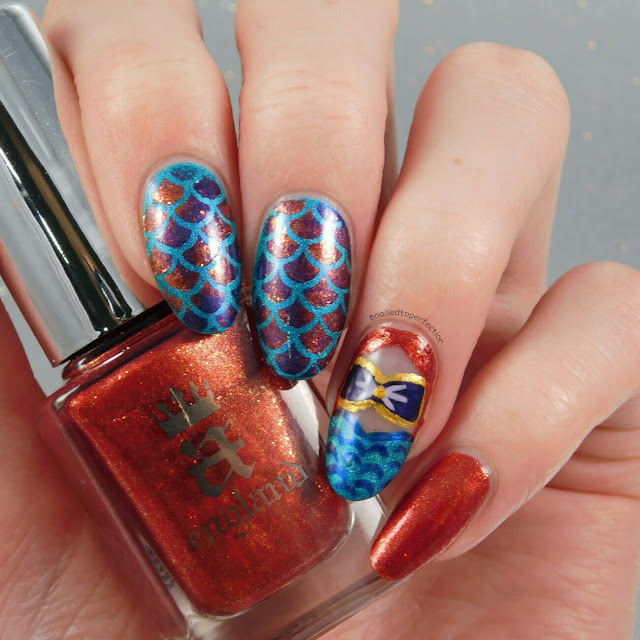 It's quite an orange toned red with ultra fine gold flakies. This is two coats and no top coat. 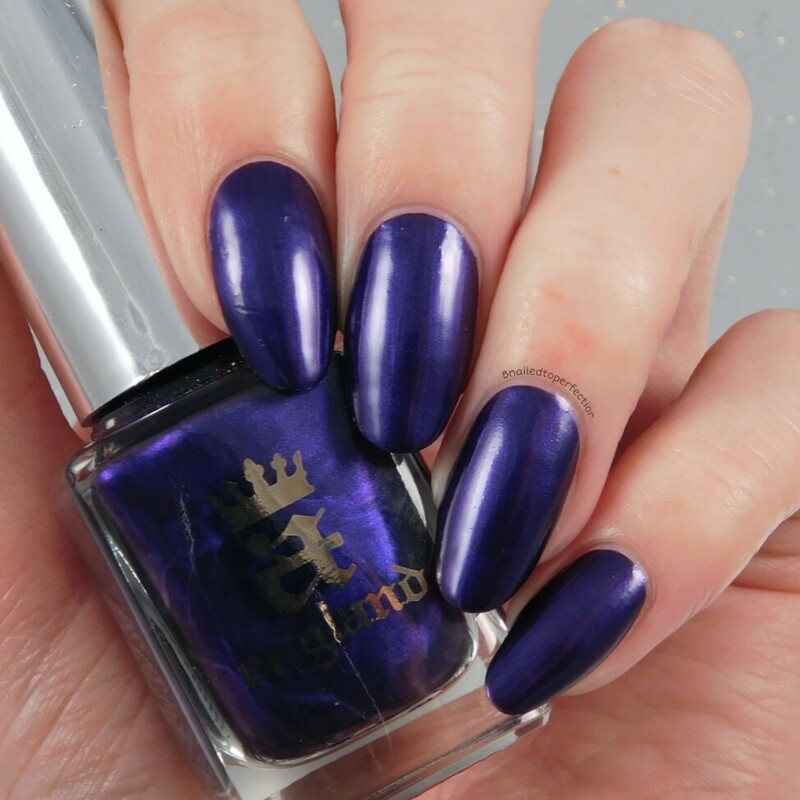 The Blessed Damozel is a rich deep purple with a metallic finish. It really reminded me of a Cadbury's type purple! This is one coat with no top coat. Now this is the star of the box. I have been lusting after Whispering Waves since I first saw swatches of it and boy it did not disappoint. It is a beautiful bright holographic turquoise and in some light has a purple sheen to it. I really loved this polish the most but I would as it's turquoise. Simply stunning. This is two coats and no top coat. In direct LED light to show the holo. This was the first look I created with my Meebox goodies. I used the mermaid stencils over Whispering Waves and sponged on a random gradient of Gloriana and The Blessed Damozel. 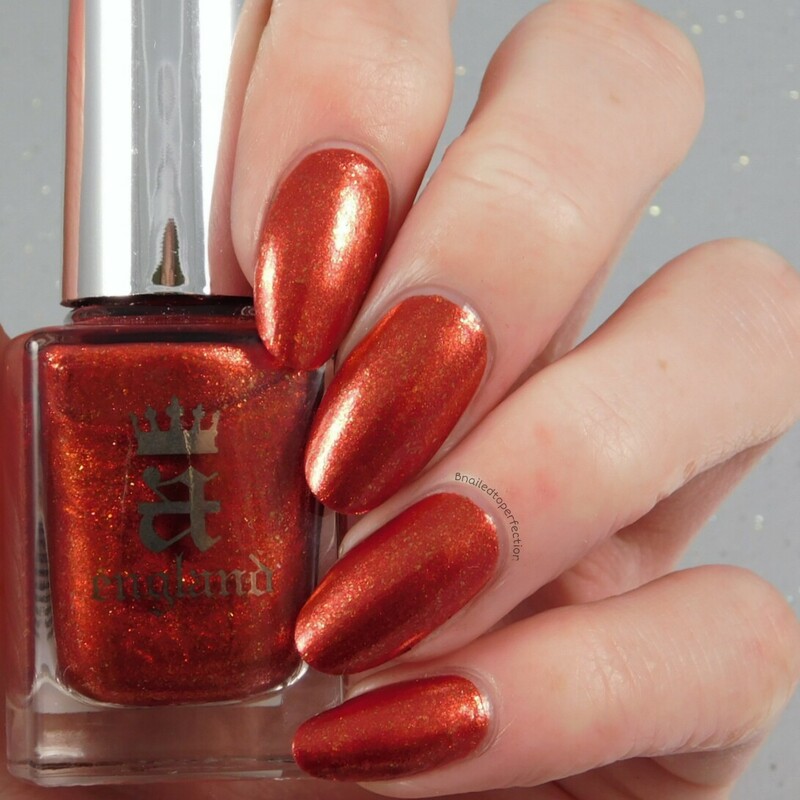 I really love the finish that Gloriana has given to the nail. It actually makes the scales look almost real! 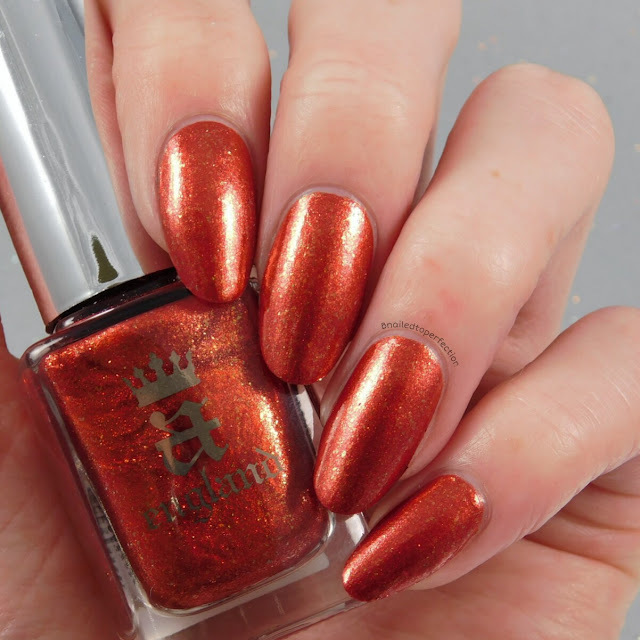 I applied Gloriana to my pinky. On my ring finger I had Whispering Waves on it's own and added one of the starfish embellishments. After a few days the starfish had come off so I recycled my mani! I tried a bit of freehand, which I am not great at! This is my attempt at a mermaid. Gloriana to represent the hair, The Blessed Damozel for the shell bra and Whispering Waves for the tail. I also used Lotus Begins by China Glaze and It's Raining Men by Color Club which were from previous boxes. This box was a corker! 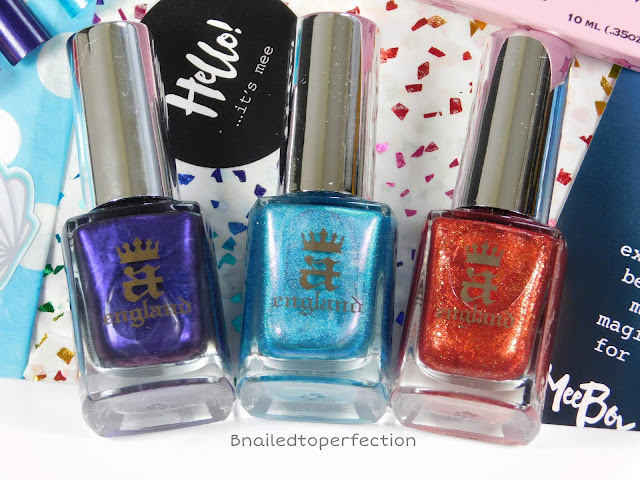 The polishes alone cost £11 each and the box only cost me £18 ( I had a discount code as it was the first box I ordered, it's normally £20). What do you think of this box? 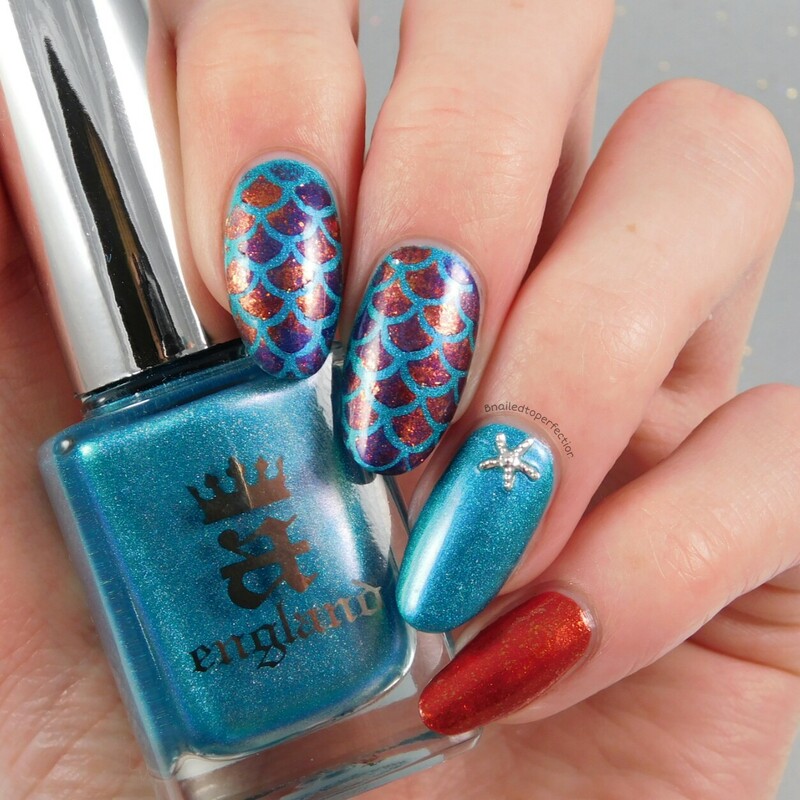 Which nail art look do you like the best?